The beginning of a historic church restoration or new design requires research of many kinds. This blog explores the first major steps that propel the project forward. The first two, Paint Investigation and Plaster Survey are the combined efforts of on and off site research and analysis. Both of these studies survey the walls, the condition, the history, and stability. The mockup sheds light on what the space can become by choosing an area in the church to introduce the original or new design: color schemes and patterns. A paint investigation, as the name betrays, analyzes the layers of paint. Many churches were painted solid colors, often grey or white, in the 1970s, this process allows us to uncover the decorative paint schemes and colors that lay beneath the whitewash. The lack of decoration combined with a complex structure can actually weaken and distract from the architecture. Design is meant to complement and support the architecture. Without design, unique features in the building are lost. To further understand the basics behind the relationship of architecture and decoration read Owen Jones’s Grammar of Ornament. The plaster survey considers the condition of the plaster throughout the building. With access to the attic, we can determine through an analysis of the plaster its condition, age, material, and whether repairs need to be made. A plaster survey is an analysis that determines the cause of the failure in order to explain the effect. The survey also provides the means to establish an efficient plan of action to properly repair the damage. The mockup provides a look into the future, truly it is foreshadowing the beauty that is to come. In either a side chapel or an aisle bay, we can make a full scale, on site model of the proposed design scheme. 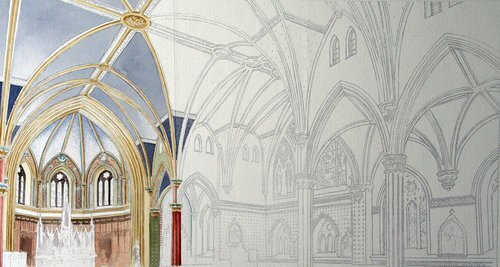 This process allows the church to “try on” the design, encouraging curiosity and excitement among the parishioners. Mockups provide a roadmap for budgets, fundraising, and a window into the final product. Witnessing the mockup being painted on site demystifies the process of restoration allowing the parish to understand the creative process in action. Where do you stand in the process? If the church is solid grey or white and built before 1950, chances are, there are decorative paint schemes and designs beneath the whitewash. If you are interested in repainting the church, this is an excellent opportunity to better understand the church’s decorative history. With the discoveries from a historic paint analysis, the church could be restored to its original interior or a new design can be developed based on the original. If there are cracks in the ceiling plaster whether the causes be water damage, time or unknown, the plaster may be failing. If the church has in the past or is planning on updating HVAC, lighting or sound systems, the plaster may be compromised due to the stress of new equipment. If plaster falls into the space below, the plaster is most certainly failing and a risk to those who frequent the building. If you’re planning a decorative paint campaign, it is in your best interest to inspect the plaster before embarking on endeavors dependent on the stability of the plaster. If there is uncertainty of how the colors and designs will look in the church, a mockup is a cost efficient way to visualize the completed effect of the project. If there is need of fundraising, a mockup acts as an excellent way to engage parishioners in the project. The mockup gives the congregation a hint of what might become and encourages the project into production. If unsure, most conservators would welcome an initial conversation to guide you in the right direction. Conducting a study at the beginning of a project, before other work has begun, can often save you money in the long run by helping you anticipate unseen issues and challenges, avoid costly mistakes, and understand your structure on a more holistic level.